Quad layouting, i.e. 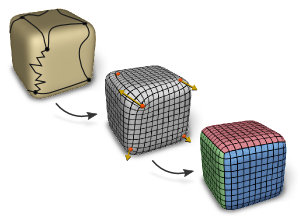 the partitioning of a surface into a coarse network of quadrilateral patches, is a fundamental step in application scenarios ranging from animation and simulation to reverse engineering and meshing. This process involves determining the layout's combinatorial structure as well as its geometric embedding in the surface. We present a novel quad layout algorithm that focuses on the embedding optimization, thereby complementing recent methods focusing on the structure optimization aspect. It takes as input a description of the target layout structure and computes a complete embedding in form of a parameterization globally optimized for isometry and, in particular, principal direction alignment. Besides being suited for fully automatic workflows, our method can also incorporate user constraints and support the tedious but common procedure of manual layouting.